All Florence homes currently listed for sale in Florence as of 04/25/2019 are shown below. You can change the search criteria at any time by pressing the 'Change Search' button below. "Completly fenced 60 ac. ranch land and Home, this was the headquarters for the England Cattle Company. Modular 2BR 2BA with office, Great room with Wet Bar and dining area, Kitchen has nice breakfast bar and tiled floor. Large enclosed screened patio, great for entertaining or feeding your cowboys. Butcher Shop, Tack Room, Corrals, squeeze chute, Scales and lots more see attached list in document section. Antique Tractor in front yard does not Convey Make appt to see. 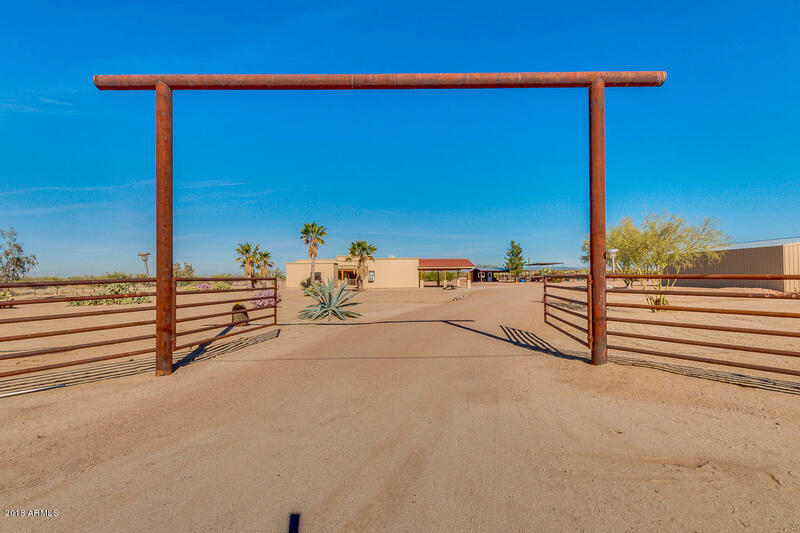 Pre-qualified buyers please"
"Immaculate horse property shows perfection in every aspect. 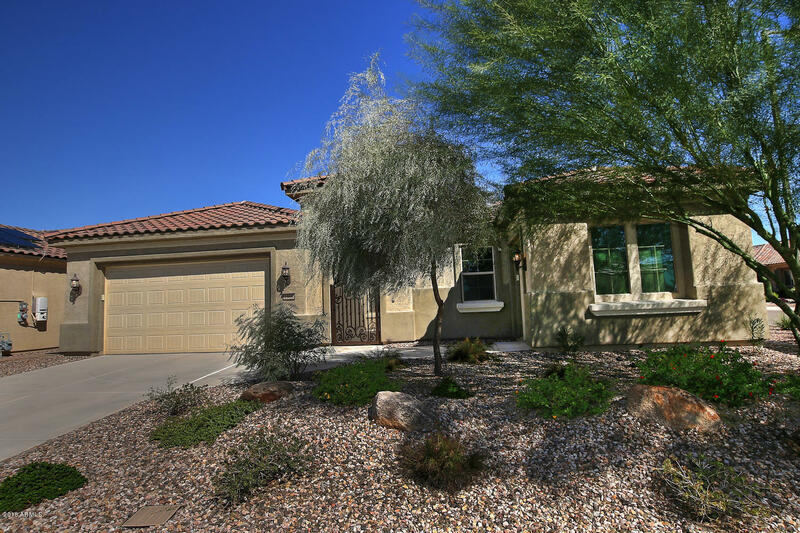 The 1931 Sq Ft completely remodeled 4 bedroom, 2.5 bath home showcases upgrades throughout. Great room has wood burning fireplace and rustic beamed ceiling , gorgeous upgraded kitchen, entire home is light and open. It is placed on 5 acres of completely developed horse property. 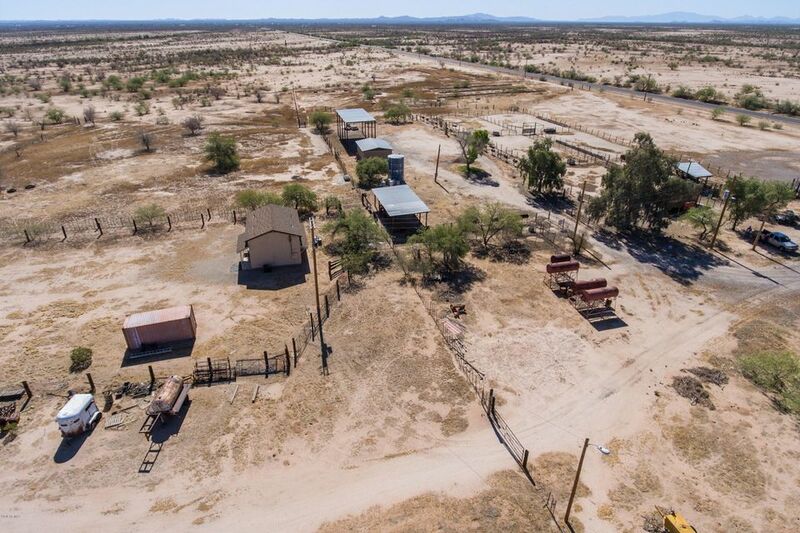 Property includes 2 arenas, 235x135 and 160x100, 70' round pin, 6 covered stalls, 12x15 tack room, 36x40 and 12x40 out buildings, 60x60 barn, 20x50 covered h"
"Secluded, pristine, High Sonoran Desert ranch. 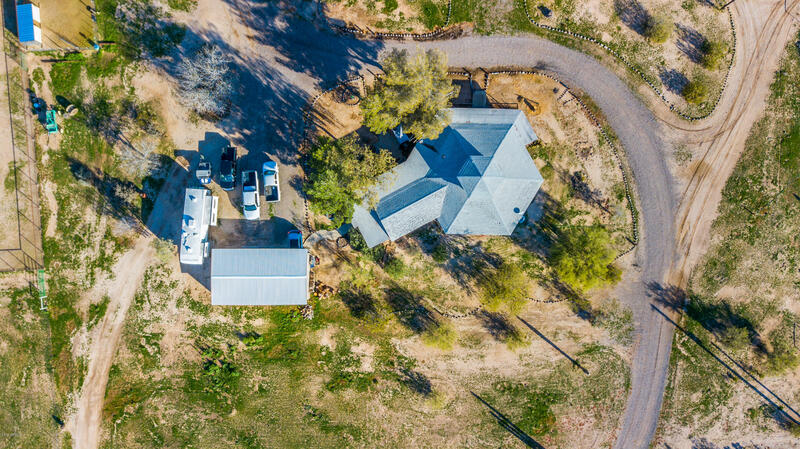 Gated entry, completely custom, energy efficient home with full solar, back-up generator and owned well situated on approximately 40 acres sided on two sides by State Trust Land with endless views. 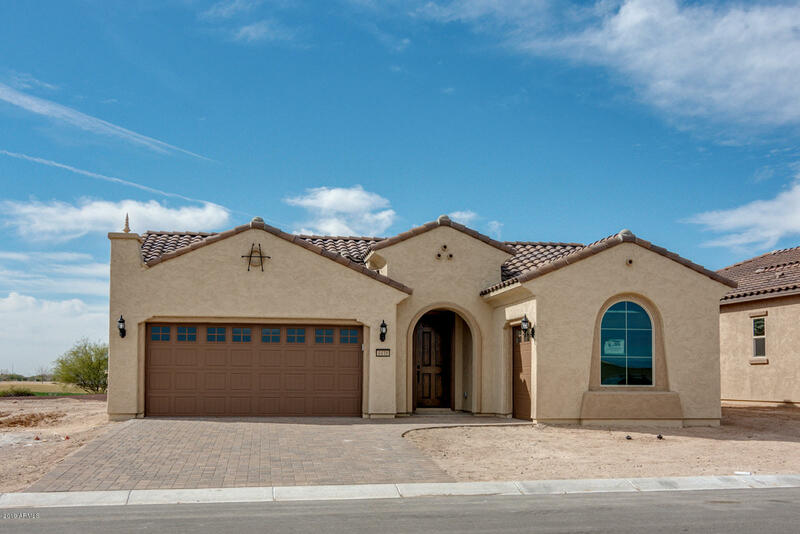 ''e-Crete'' block construction, Pella triple pane wood frame windows, custom cabinetry, Italian tile flooring, Granite counters, ceiling fans throughout, dual evaporative coolers, forced air fireplace, over 4,000 sq. ft. under roof with large covered pati"
"Real Estate 101: LOCATION, LOCATION, LOCATION! 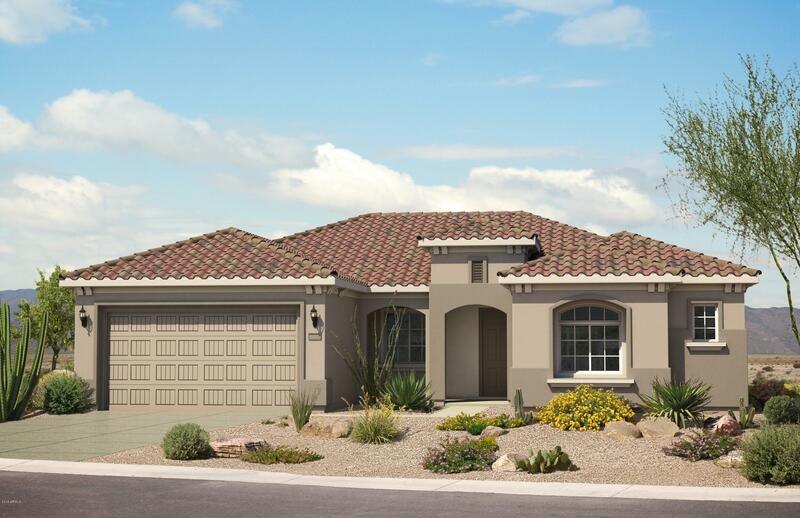 Enjoy this stunning and very popular ''Journey'' model on a spectacular lot in Sun City Anthem at Merrill Ranch. This gorgeous home is located on a PREMIUM north/south facing, 1/4 acre lot w/common areas and paths to the west/north and that's just the beginning. The outdoor living space features mature landscape, private paver courtyard, extended paver patio, built-in BBQ and bar top seating, gas fire pit, 5 zone watering system, PVC irrigation, LED"
"Simply stunning! 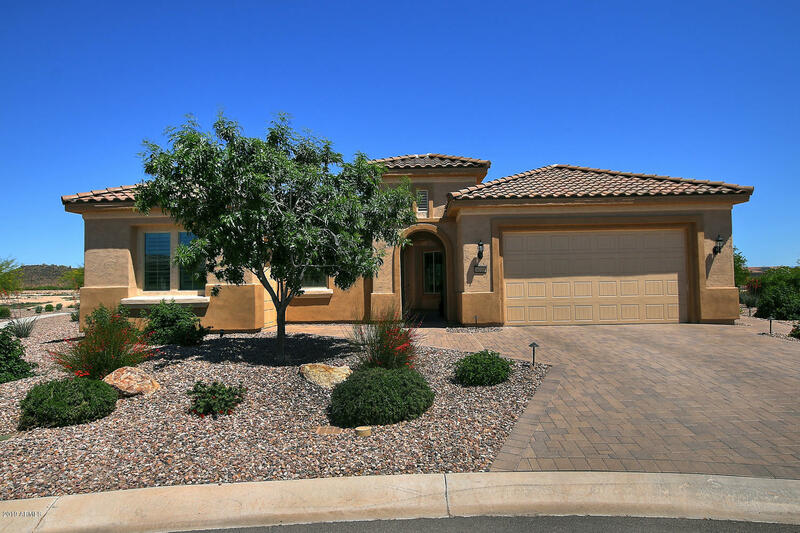 This meticulously well-maintained home will easily rival any new home model you will see. Situated on the golf course, this home is beautiful inside and out and overflows with amenities designed for both relaxation and entertaining. Enjoy the sense of community this neighborhood provides and welcome your guests in your front courtyard. The open floor plan is a welcoming invitation to enjoy all this home has to offer. The gourmet kitchen is loaded with cherry cabinets and beauti"
"Country life at its best! One of a kind 3 bedroom 2 bathroom home with vaulted ceilings that is showcased by gorgeous wood beams throughout. 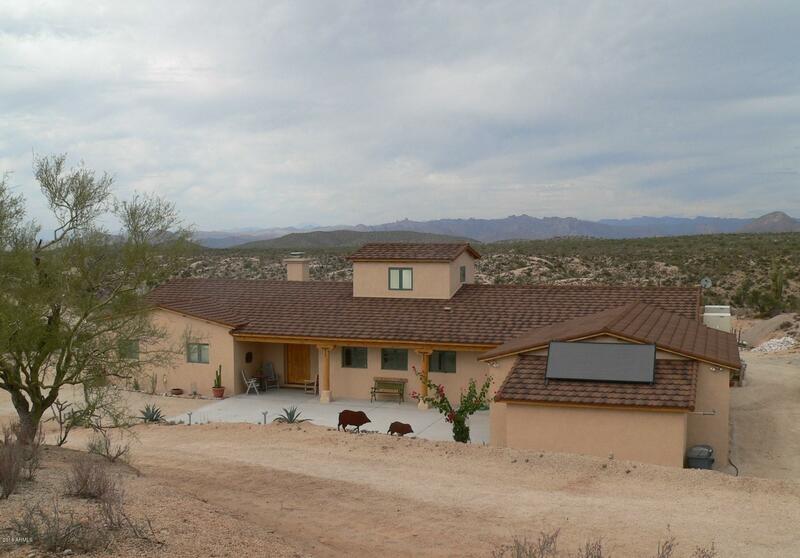 Enjoy year round southern desert living on a 3/4 wrap around wood porch. This beautiful fully fenced 20 acre property is located approximately 7 miles south of The Historic Town of Florence. The property features a 20' x 40' covered carport and storage. Bring your RV and connect to electric and water next to the carport! 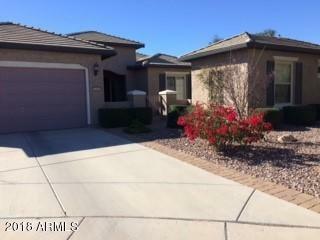 Additionally, there is a workshop an"
"Beautiful 4 bed, 3 bath home on a 2.5 ACRE IRRIGATED LOT! Fabulous great room floor plan with custom paint finishes, vaulted ceilings, tons of natural light, and den/office room. Gorgeous kitchen outfitted with stainless steel appliances, breakfast bar, pantry, recessed lighting, tile back-splash, granite countertops, and cabinetry space. The spacious master suite has french doors that opens to patio, walk-in closet, and full bath with double sinks, separate tub, and step-in shower. Backyard has"
"SOUGHT AFTER PURSUIT FLOORPLAN WITH STUNNING FINISHES AND UPGRADES. THIS NEW HOME WILL BE READY JANUARY 2019. SITTING ON THE TEE-BOX OF THE 9TH HOLE OF AN IMMACULATE TROON GOLF COURSE. 2 BEDROOMS, 2 BATH HOME PLUS DEN IS FULLY UPGRADED WITH CHEF KITCHEN, WET BAR IN GATHERING ROOM, BOW WINDOWS IN CAFE AND MASTER BEDROOM, CUSTOM FRAMED WALK- IN SHOWER, BUILT-IN ENTERTAINMENT CENTER IN GATHERING ROOM, EXTENDED GARAGE WITH PLENTY OF STORAGE SPACE AND MUCH MORE. A MUST SEE." 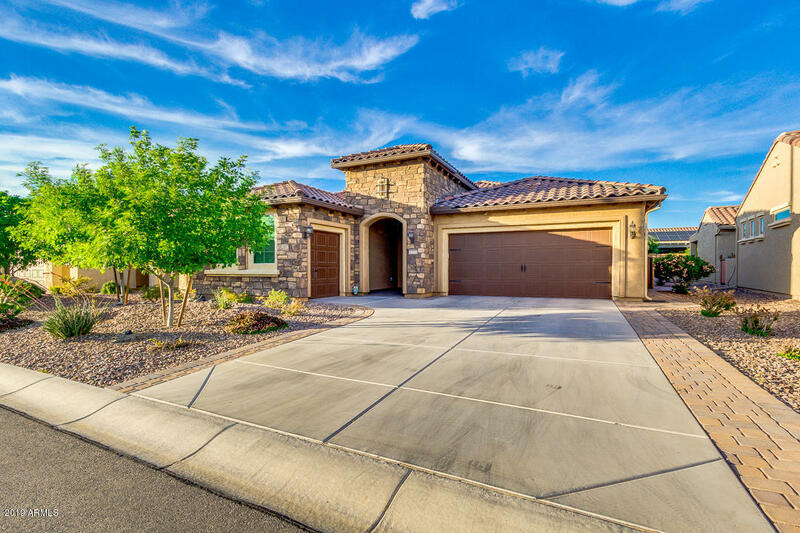 "Outstanding Lexington model located in Anthem at Merrill Ranch. This home has many outstanding features. The front courtyard, circular foyer & wet bar to start. Large great room with dining area & lots of large windows. A gourmet kitchen with stainless steel appliances, large island, double ovens and lots of cabinets. Breakfast nook with door to patio and desk area. Powder room is half bath. Guest room has it's own bath and walk in closet. A large master bedroom with door to patio. Maste"
"A beautiful Paramount Floor plan on the golf course. This home is spotless inside & out! Beautiful paver front courtyard full fenced with gate. Tile throughout kitchen, great room. Private den. Huge master suite with bay window double vanity & sinks. Separate garden tub & shower. Nice walk-in closet. All overlooking the beautiful green golf course! Large kitchen with maple cabinets, travertine backsplash, large island, eating area, plus stainless appliances with two wall ovens. 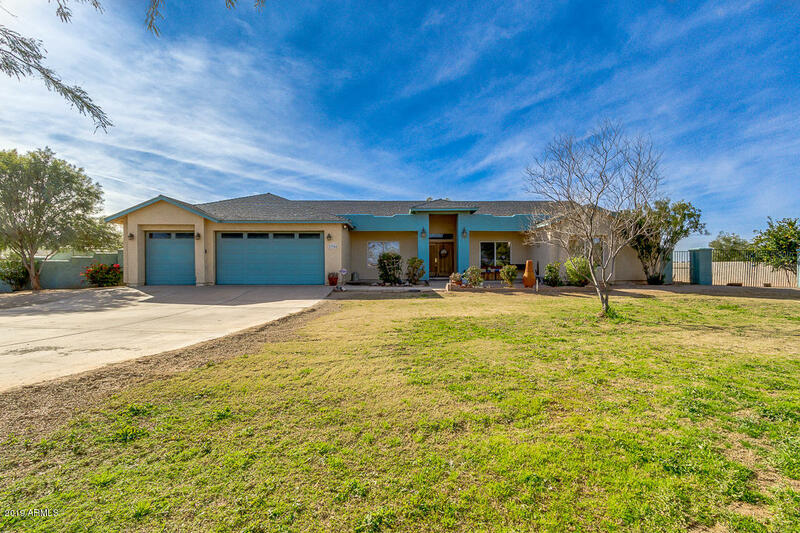 Pend"
"Beautiful, immaculate home and guest casita located on the 15th Fairway of the Poston Butte Golf Course located in Anthem Merrill Ranch - Sun City.This 2 bdrm, 2 bth home includes a beautiful appointed guest casita located off of an interior courtyard. The home has an open floor plan with a home office and butler pantry . 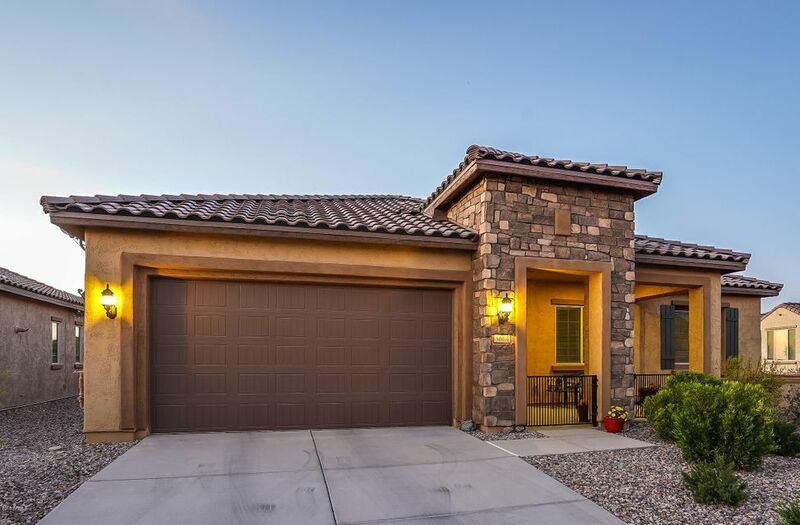 The covered patio over looks the 15th green a private putting green and a gas fire pit.Sun City Anthem and Merrill Ranch is an Active Adult Community (55+)." "GORGEOUS VIEW. 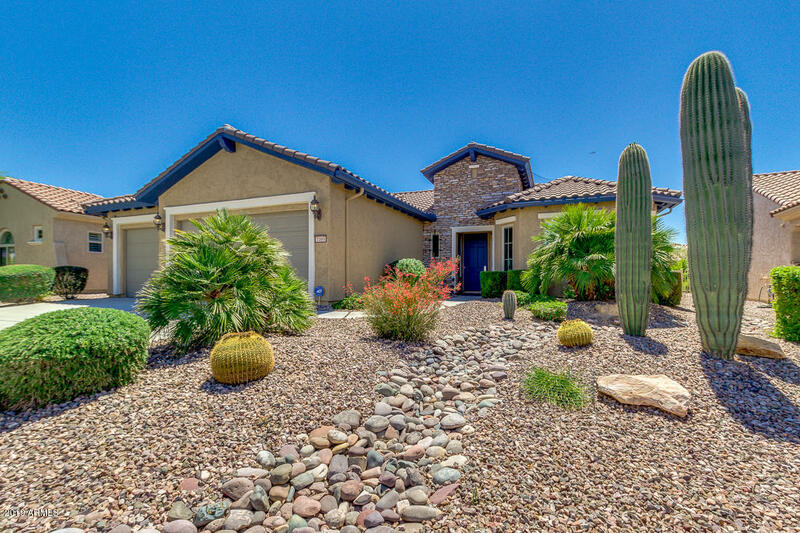 THIS BEAUTY SITS ON MAJESTIC TROON GOLF COURSE WITH A STUNNING, PANORAMIC VIEW. 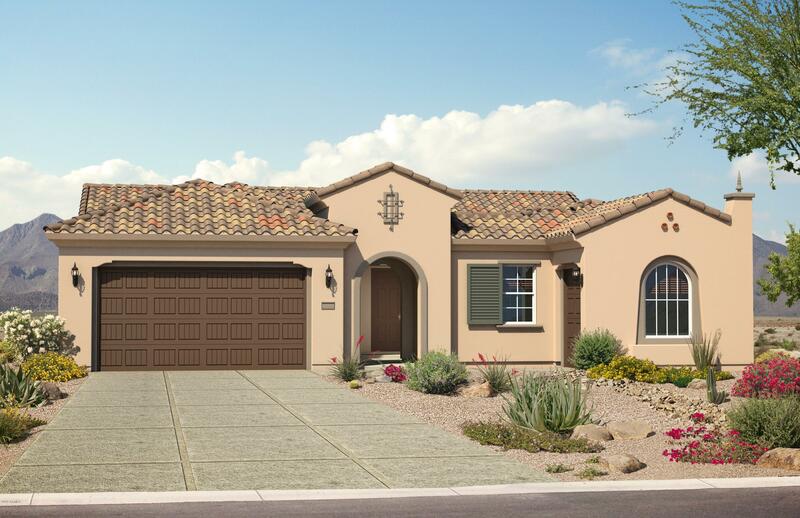 THE HAVEN FLOORPLAN HAS 2 BEDROOMS, 2 BATHS PLUS DEN ENCLOSED WITH FRENCH DOORS. IMMACULATE CHEF KITCHEN WITH UPGRADED GRANITE, MAPLE CABINETS AND GAS COOKTOP. KITCHEN OVERLOOKS PRIVATE, PAVED COURTYARD. MASTER BEDROOM IS A RETREAT WITH BAY WINDOW, UPGRADED BATHROOM W/DROP IN TUB, SEPARATE SHOWER W/SEAT AND GRANITE COUNTERTOPS. OVERSIZED, COVERED PATIO HAS BUILT-IN STONE, GAS FIREPLACE. PLUS, ATTACHED "
"Enjoy the outstanding views of the golf course while preparing your favorite feast in your low maintenance back yard. This gorgeous open floorplan will have you inviting family and friends to any gathering. The kitchen boasts a large granite island, stainless appliances, and soft-closing drawers for the chef in the family. Large windows in the Master Bedroom and Dining Room provide dramatic views of the golf course. 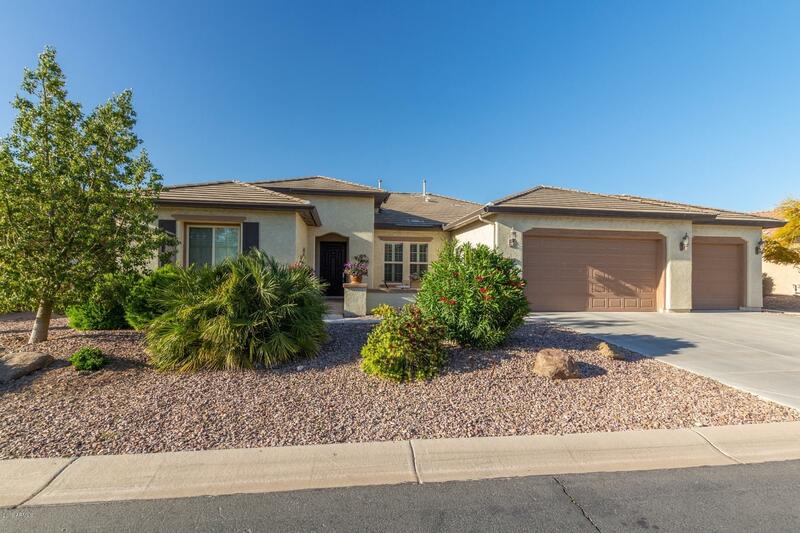 Upgrades include a walk-in shower, entertainment wet-bar, DEN, 4' Garage E"
"Stunning Endeavor Floorplan within the heart of Sun City Anthem. Fully upgraded with gorgeous interior finishes offering 2 bedrooms, 2.5 baths plus den. This home boasts fabulous wet bar, perfect for entertaining. Chef Kitchen with gas cooktop, upgraded granite, cabinets and flooring throughout. Wood-like plank tile in all areas but bedrooms and den. Attached cart garage, plus an extended 2+ garage with extra storage. Custom tile walk-in shower in master bath." "''Preserve'' model with all the upgrades, pride in ownership on display in this home. 55+ community This beautiful 2bd 2bth +den, 2 car extended + golf cart garage, professionally landscaped is packed with upgrades. Split floor plan, granite counter tops throughout, gourmet kitchen, water softener, water filter, reverse osmosis, walk in pantry, wall of glass doors in living and dinning area, master has a separate entry to patio, master bath has a tiled walk in shower with overhead rain shower "
"Gorgeous Journey floor plan to Be complete in May-June 2019 with dual master suite and den. 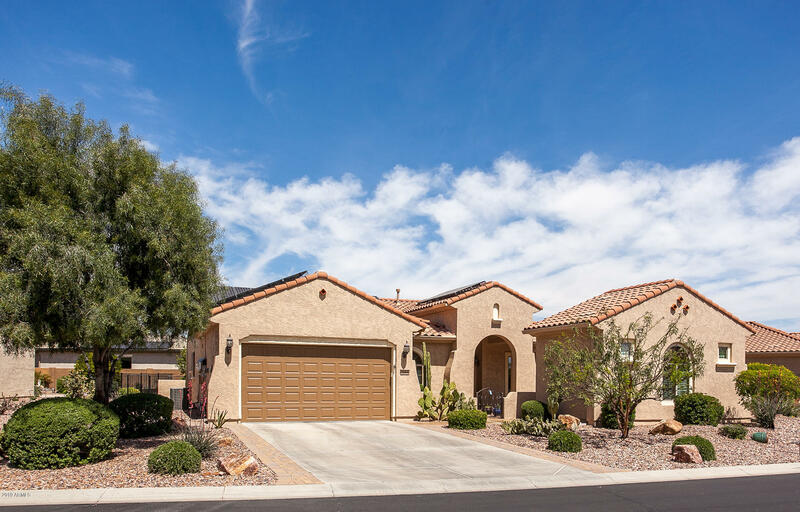 This offers 10 ft ceilings throughout and upgraded interior finishes, including gas chef kitchen, white antiqued cabinets throughout, upgraded granite counter-tops and flooring. Outside you'll find private courtyard, outdoor gas fireplace on back patio, oversized lot and golf cart garage." "Enjoy your ''Journey''.....model in Sun City Anthem at Merrill Ranch with this extraordinary open floor plan concept. This stunning home offers all the upgrades and options you are looking for, without the 8 month delay of building new. 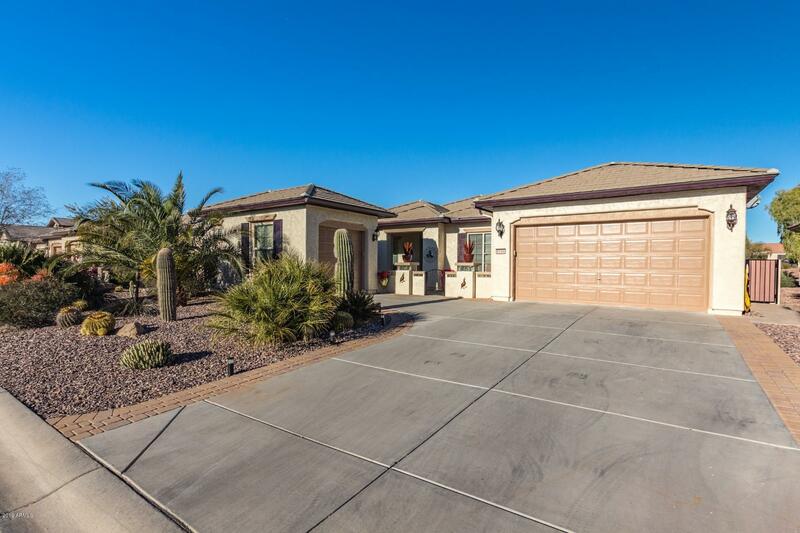 The home is nestled in on a premium corner lot and is professionally landscaped, featuring a travertine entry and private courtyard, large covered patio, fenced backyard, privacy wall and mature desert landscape. 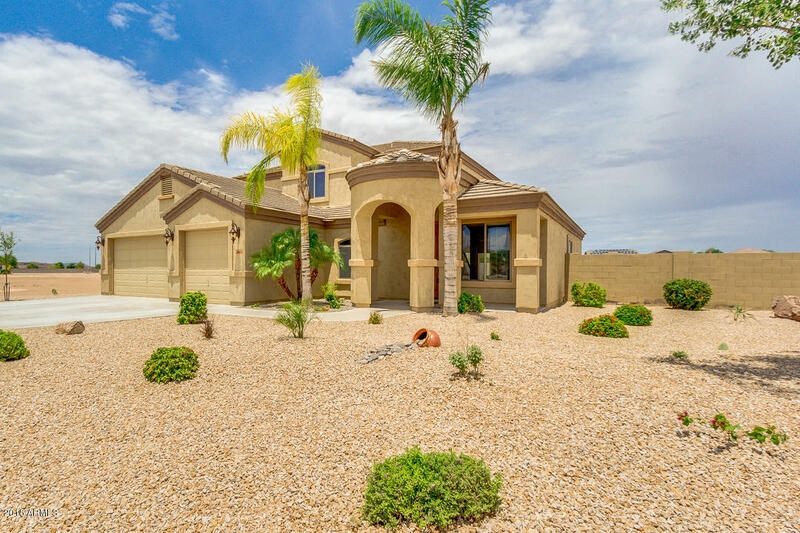 Some of the many benefits of this beautiful home i"
"Enjoy all that Sun City Anthem has to offer with this top selling Arcadia floor plan! Sitting on a private corner home site, close to Community Center, Pools, Championship Golf Course and more! Great home for entertaining, large front porch plus private guest casita with it's very own bedroom and bathroom. Inside the main home, you'll love the massive 10 ft ceilings, large eat in kitchen, oversized master bedroom with luxurious bath featuring a separate tub and walk in shower. 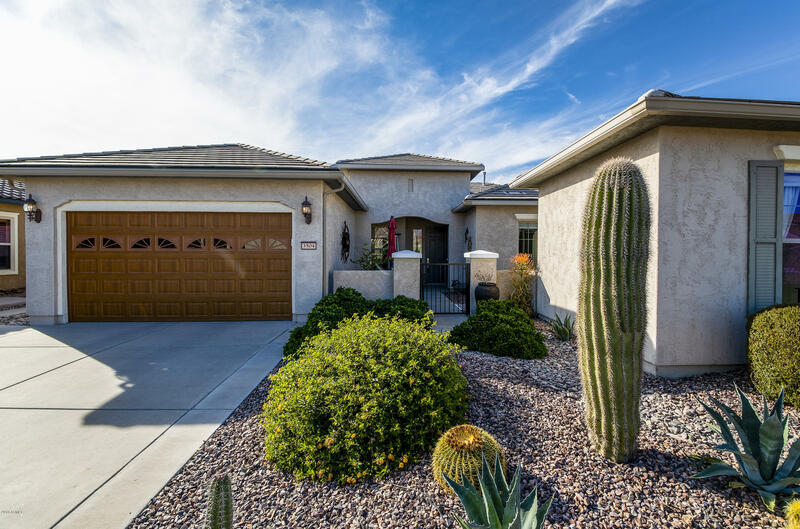 Open den, perfect "
"Enjoy the stunning views of the Poston Butte Golf Course! 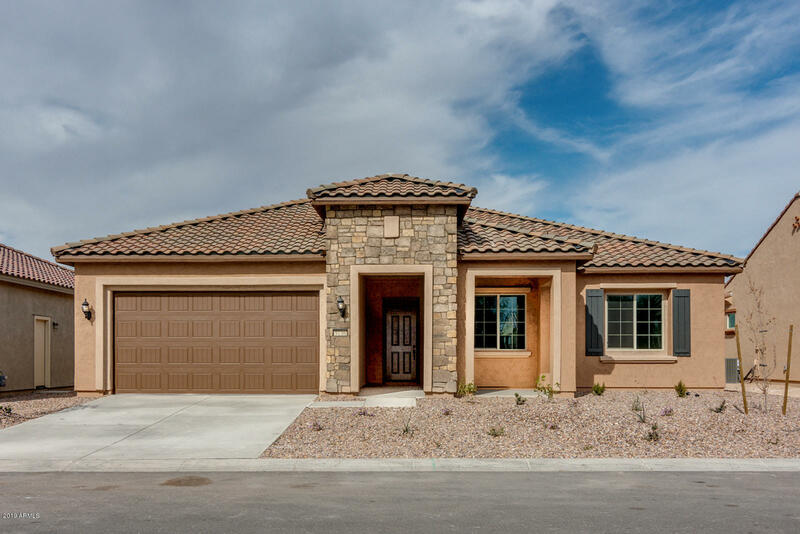 This beautiful ''Arcadia'' model of Sun City Anthem at Merrill Ranch is very well appointed and priced to sell with new build golf course lot premiums on the rise, this home is an absolute bargain! Spectacular views are just the beginning of the benefits, upgrades and options of this gorgeous home. The open floor plan concept boasts upgraded tile and carpet, neutral color scheme, plantation shutters and shades, R/O system, water softener,"
"Great Opportunity to own a Premier home in Sun City! Priced to sell! The builder doesn't make this Beautiful floor plan with 3-Car Garage anymore and definitely nothing at this low price! This home has 10-foot Ceilings, Spacious Living areas include: Large Eat-in Kitchen with Island & Breakfast Bar, Den, Master Suite, Guest Bedroom with Full Bathroom. Tile in main areas, Upgraded Carpet in Bedrooms and Den, Neutral Paint, Window Shades, Ceiling Fans, Softwater System and More! The Gourmet Kitch"
"Outstanding home in a quiet friendly neighborhood. 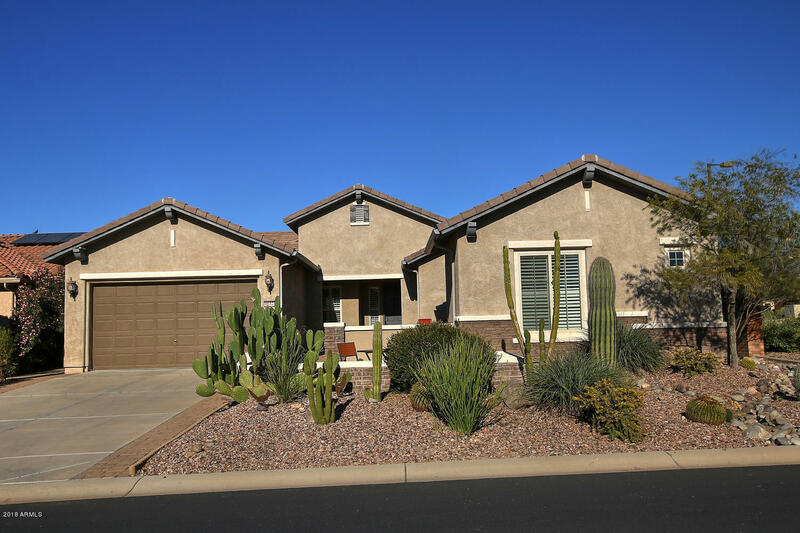 Features include: an open floorplan, guest casita with full bath, spacious patios front & rear and a private back yard with fruit trees. You will also appreciate two of the most in demand features: SOLAR ELECTRIC with prepaid lease, and an EXTENDED GARAGE with epoxy floor coating and cabinets. Recently added improvements by owner include: refinished kitchen cabinets, tile flooring, upgraded gas cook top, washer, dryer, refrigerator, and window"
"MAKE A SPLASH and entertain poolside with this stunning and rare ''Sandstone'' model on a premium corner lot, offering 5 bedrooms, 3.5 bathrooms and a 3 car garage. 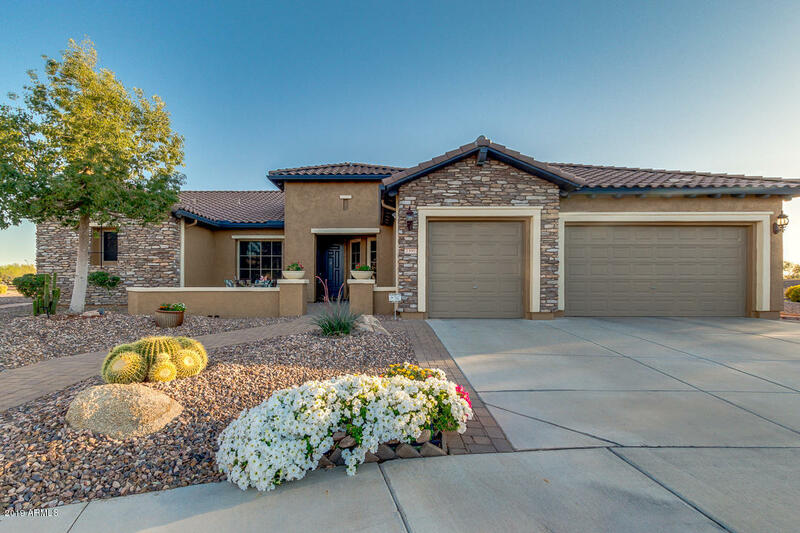 This immaculate home offers an abundance of upgrades, options and details that begin with masterfully landscaped yards and custom sparkling pool highlighted by an integrated water slide, water fall and grotto, hot tub, gas fire pit and synthetic grass. 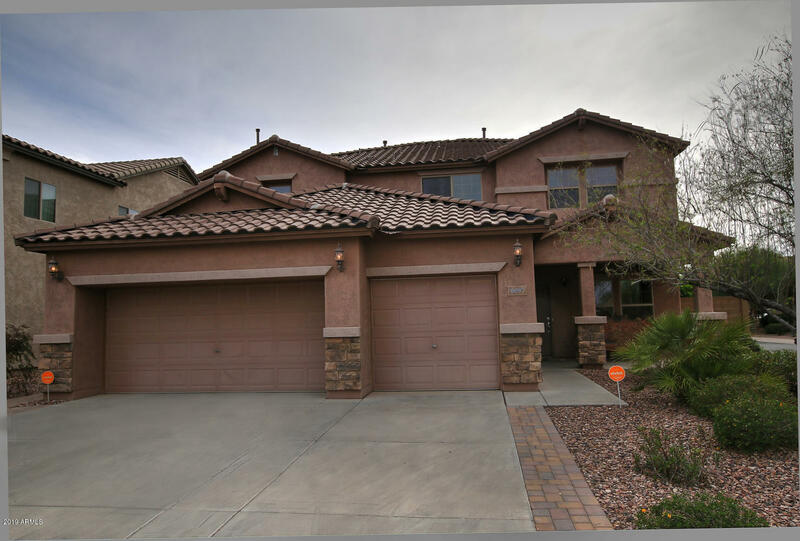 This gorgeous home opens up to an impressive great room and boasts upgraded tile a"
"Amazing 5 bedroom, 3.5 bathroom home in Florence has everything you are looking for! 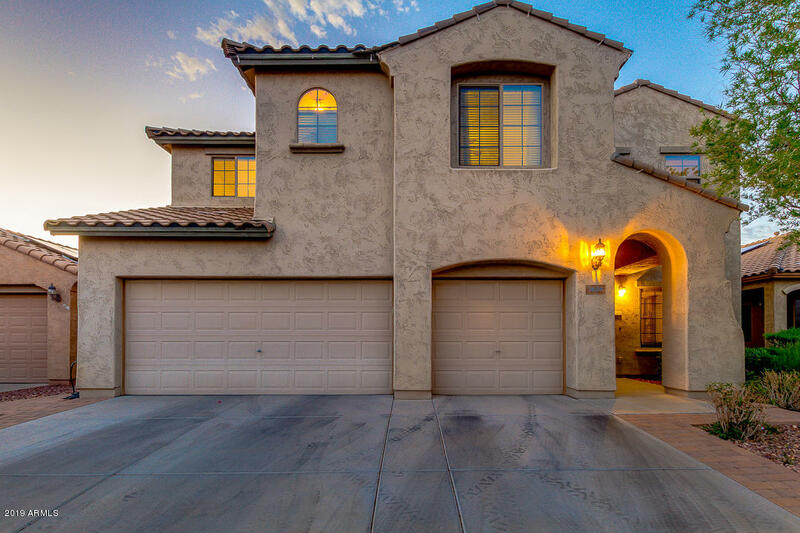 This beauty features artificial turf, 3 car garage with built-in cabinets, and great curb appeal. Interior boasts great room with living & dining, carpet in all the right places, family room, and an oversized loft. Eat-in kitchen is equipped with staggered cabinets, stainless steel appliances, large walk-in pantry, and island that adds counter space. Huge master retreat has a lavish bath with dual vanity, soakin"
"Awesome Large 3264 Sq Ft, 5BR, 3.5BA-Plus Den (Has Closet, Window)& Loft! Master Suite Downstairs w/ Walk In Closet & Double Vanities. Home Boasts a Large, Wide 12,197 Sq Ft Corner Lot, 2x6 Exterior Wall Construction, N/S Exposure & Many New Updates in 6/18. (All New Carpet, Interior 2 Tone Paint, 2'' Faux Blinds, New Black Stainless Samsung Appliances including Refrigerator, New Water Softener, Water Heater & Mop Sink in Laundry. All New Landscaping Installed Front & Back including all New Irri"